Obtain a maximum ultraviolet (UV) energy at optimum wavelength. With its efficient and customized water cooling system, it allows modified design such as the large UV-LED. The UV-LED becomes more fragile as the size becomes larger, but it will surely achieve long service life with its own cooling system. Configuration for small area to large area. 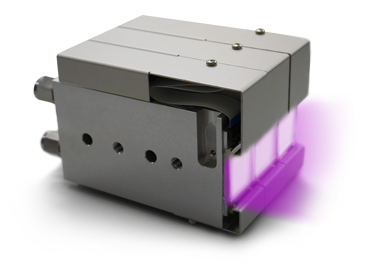 UV curing with minimum temperature increase and less thermal damage possible. Very thin, compact, and lightweight. Has built-in cooling device (water cooling system). Preliminary running time is unnecessary by turning on / off the UV-LED instantaneously. It can also be used on products with curvature. 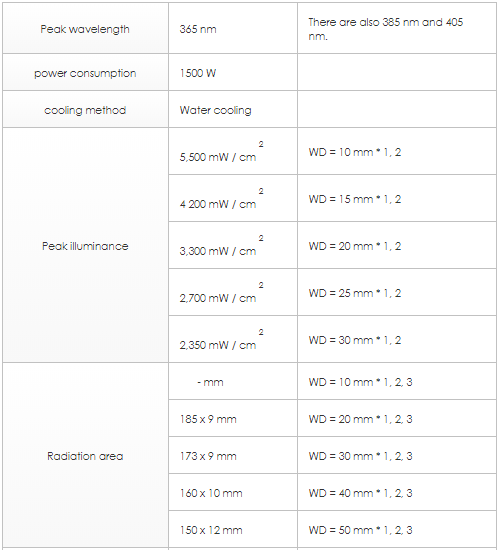 Because the UV-LED chip has a long life, great reduction in running cost could be obtained. Note: Free irradiation design is possible by configuration according to shape, size, and pattern.